In February, we got out first peak at the alleged “Facebook phone,” the INQ Cloud Touch. The Android-based smartphone has a customized UI layer and put Facebook features at its forefront, but now the handset will be getting a significant feature truly confirming that it is not a “Facebook phone”: INQ will be integrating Foursquare for the Cloud Touch’s location services. Foursquare announced at TechCrunch Disrupt that its check-in, recommendation, places nearby, tips, and to-do features are among the services that will be built-into the phone’s Android OS and will roll out with an update sometime in the next few months. Because INQ was able to use Foursquare’s open API, Cloud Touch users will be able to utilize Foursquare sans app. According to INQ, Facebook and Foursquare will work side by side to give users the full social-mobile experience with two corresponding homescreens for each platform. 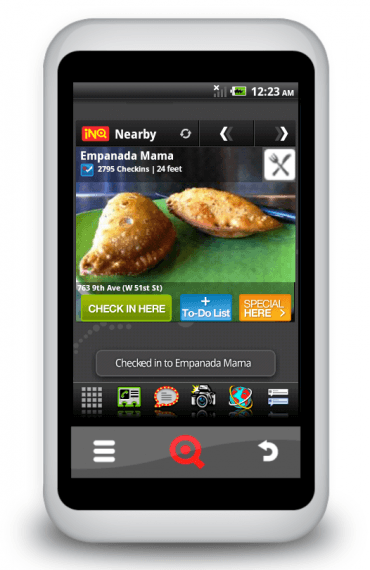 “The Foursquare experience on INQ is all about engaging a customer to really explore and discover interesting places. First, we’re looking to make it really easy for a consumer to discover and sign up to Foursquare itself, via the start-up sequence. Then we’re taking Foursquare’s great knowledge of the world around you and visualizing that on your home screen, enabling you to explore events, restaurants, clubs, etc. and even bookmark places in a to-do list,” INQ CEO Frank Meehan says. Considering Facebook’s recent introduction of Deals, and its Places service combined are virtually Fousquare-lite, it’s interesting that INQ sought a competitor service for its social-mobile experience. Of course, Foursquare’s growth rates are astronomical – it now has nearly 10 million users. And while Facebook’s Places (and presumably Deals) are popular features of the network, they don’t begin to threaten Foursquare’s grasp on the geo-social market. It’s also interesting to see these two services work side by side, considering their ambitions: Foursquare has made it clear it wants to become a more social site with its updates, and Facebook has been focusing on the location trend. Of course, Facebook isn’t the only potential competitor Foursquare will be collaborating with. The site is rumored to be partnering with Groupon to offer daily deals, but CEO Dennis Crowley wouldn’t comment about the possibility. The phone is currently scheduled only for a UK release in late summer or Fall, but if it takes off, expect to see it on our shores either late this year or early next. Are 3D-capable theaters delivering dim 2D movies?